When we start to learn a foreign language especially the one involving an unfamiliar and strange script, it is the task of learning its alphabet and its writing system that gives an average learner the first daunting challenge. Therefore, for the benefit of intending Hindi learners, I would like to give a brief intro about Hindi Writing System called Devanāgarī. Devanāgarī is a script which conforms to Abugida system. In Abugida, vowels do follow consonants as in Latin script, but they don’t come as separate letters; instead they come as diacritical marks above, below and sides the consonants. Or sometimes, a vowel is mixed into the consonant, which produces a new character. The actor, Rishi Kapuur is the son of the filmmaker, Raaj Kapuur. Did you note that the letters in Devanāgarī appear hanging from a line? They are also added marks above and sides: े , ै , ा , ि , ी, and below ़‌ , ु , ू of them. So, here you are faced with a foreign script, so very differently written! How should we learn it in the first instance? And this, I guess, is the question the Duolingo team is grappling with. How to teach the Devagnagari in the best possible way! I view two types of language learners. The first one might follow a rather pure approach. He/she may like to start learn how the alphabet letters are formed, would like to familiarize with them, practice drawing them etc. and then how they are joined (or sometimes altered) to form words. At the onset, I would recommend them to visit the SOAS Devanāgarī Learning Site: Hindi Script Tutor which provide an excellent introduction, and some good listen-recognize tests for learning Devanāgarī alphabets and script. The first type of learner, of course, would like to spend a good time there until they feel they have familiarized themselves fully with Devanāgarī. The second type of learners should also spend some time there at least to have the feel of Devanāgarī letters. But, who are these second types? You might have imagined that they are the ones would like to cut short the time to be spent on alphabet and script learning and would rather want to be on the main course swiftly with the transliteration tools. It is primarily for the second type of learners, I am submitting this introduction to Devanāgarī and how to familiarise with its letters’ sounds through one of the many available transliteration standards. The standard that I have chosen to explain Devanāgarī letters is ITRANS which is being used as the basis of a Hindi songs’ lyrics website: giitaayan.com which is a great repository of Hindi films lyrics, where songs can be viewed both in Devanāgarī as well as transliterated in Roman script. Here, one may question why I am trying to present Devanāgarī through a transliteration package which is no longer under active development. After the emergance of Unicode, all OS are provided with integrated languages support via input methods like Microsoft IME, and Google Input Tool etc. Then, why ITrans ? Google / Microsoft Indic Language Input tool and the likes are statistical /dictioneries based transliteration model , which – on just some approximate keypresses on roman keyboards – instantly suggest probable Indic words (here it means Hindi), and the native Indian users just pick the correct one on the fly, which is very easy and fast for us. But, what about the beginners to oncoming English to Hindi course. How, they supposed to type Hindi through intelligent Indic input tools? They can't be supposed to have the knowledge of Hindi alphabet, diacritics(मात्राएँ maatraae.N) and words formation(शब्द-रचना shabd-rachanaa). How can they be supposed to press approximate keys in the first instance to get probable words to choose from? That is why ITrans. This transliteration scheme is based on one-to-one mapping. For each Hindi phoneme, there is a one English letter (where lower and upper cases transliterates to different Hindi character or diacritic) OR sometime two or three of English letters to form a Hindi letter. Thus, the learner is first introduced to Hindi alphabet through this -- one-to-one mapping based -- transliteration scheme, and later practice typing Hindi through it. 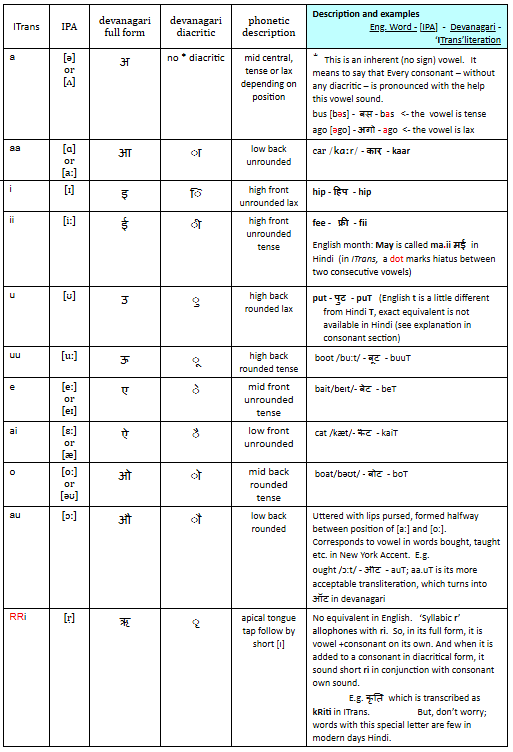 Here (via the image link given below), I present transliteration of English words (as we read them with the help of our Hindi phonic inventory) to Devanāgarī script and reverse transliteration of the resultant Hindi words back into Roman script, under the standard Itrans- Indic scripts Trans-literation Scheme. Please right click here to open the table as an image in new tab. Why does Duolingo seem to prefer the तू pronoun?